"Approaching the Exquisite Corpus" was an alternative title we considered for this DVD release. It would have indicated how the films introduced here from my early Super 8 phase already evidence an artistically consistent path leading to my most recent production to date, The Exquisite Corpus, and highlighted my endeavor since the 1980s to make the specific qualities of the analog film medium sensuously tangible in the form of "exquisite ecstasies". No matter how various the imagery of Blood-Letting, Film of Love, Holiday Film, tabula rasa or The Exquisite Corpus, each of these films crystalizes an essential impulse at the heart of my entire artistic work: to expose the utterly distinct nature of analog film in all its unique beauty, a potential and vision neither available nor transferrable to any other medium. A dream narrative of a sleeping beauty ­ a nudist found unconscious on a beach ­ intertwining different films, different bodies, caresses, screams of shock and cries of ardour, The Exquisite Corpus works to collapse the line between the filmed body, Tscherkassky´s nudes in search of each other and of satisfaction, and the film body, the celluloid that has captured these bodies, the celluloid Tscherkassky meticulously manipulates in his darkroom. Such darkroom magic teases and exposes the film itself, frames layered on one another, images masked and unmasked, perforations and flung celluloid strips playing their own game of seduction and consummation somehow at once on top of and within the choice (s)excerpts. 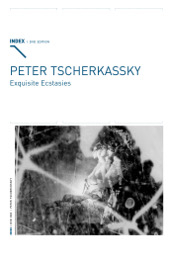 This is where Tscherkassky´s love for celluloid is wedded to his source films´ love for flesh, where the pathways to climax ­ narrative and sexual ­ are built from the same component parts of mystery, attraction, rhythm, repetition, variation, new sensations, and ecstasy. Born in 1958 in Vienna, Austria. Studied philosophy. Teaches film making at the University of applied Art in Vienna. Founding member of sixpackfilm. Booklet with exclusive material, bilingual English-German text.